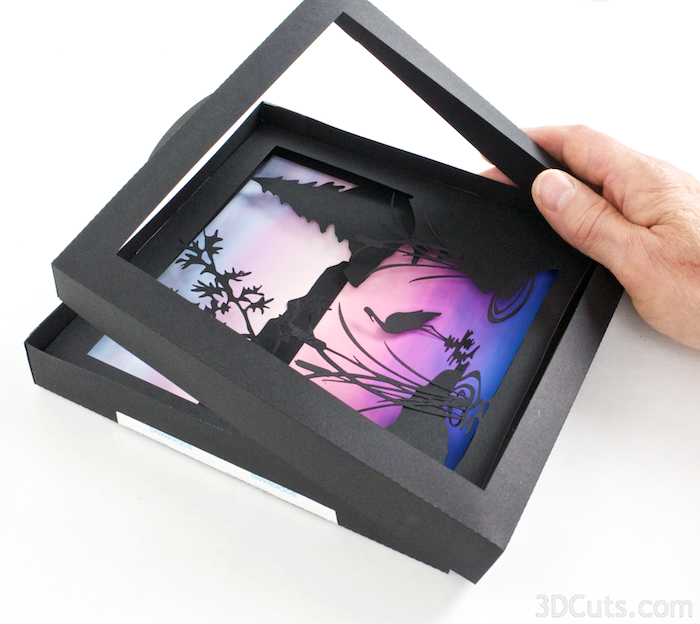 This tutorial is for the 4 layer shadow box designed by 3Dcuts.com. 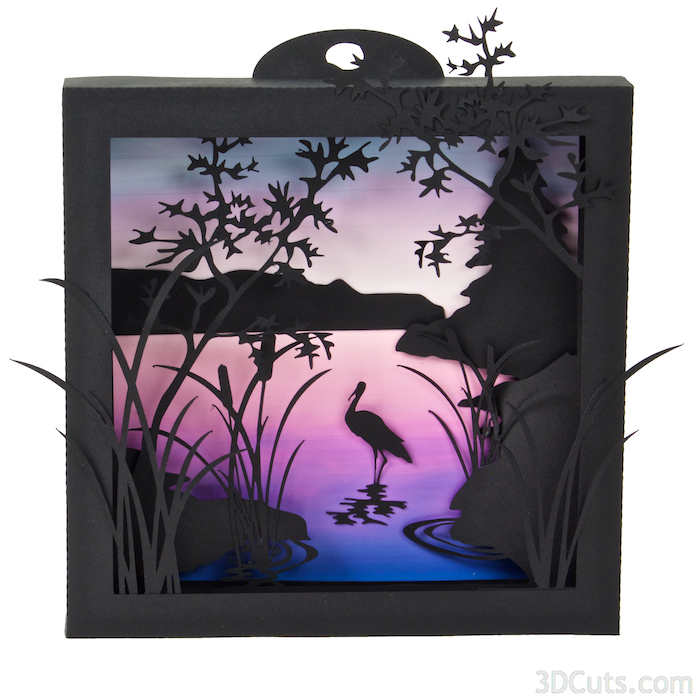 The process is similar for many of the 4 layer shadow boxes I have designed but I built Heron Cove as I photographed this tutorial. The larger of the two tree branches gets attached to the front of frame 2. Add three 1/4" foam dots to the back side of the thick part of the tree base. Adhere it to the lower left corner of frame 2 on the front side. The edges of the tree base will line up with the edges of the frame. The tree branch will rest upon the top of the frame. Place a small dot of a quick drying paper glue (I used Aileen's Tacky glue) behind the leaves that do touch the frame. This adds much needed support to the tree. There are two cattail bunches. The larger one gets glued into location on the left. Apply a little tacky glue to the back of the rushes about 3/8" above their bottom edge. Place the rushes into the water circle and on top of the land form. Glue the rushes to the front of the land form. The smaller batch of cattails get glued to the back of the land form on the right. Apply glue to front of the rushes and adhere to the back positioning them to sprout above the out cropping. 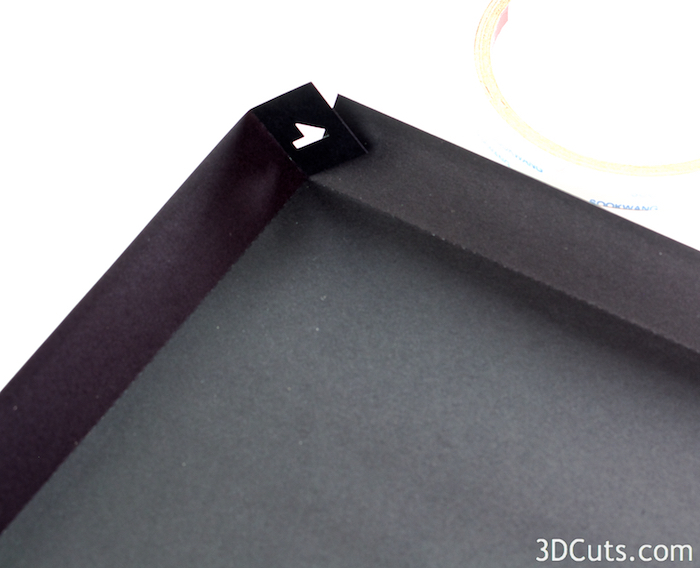 Add 3 glue foam dots to the corners of the right land piece. Attach it to the front of frame 2 in the lower right corner. Tutorial note: This piece was added in later versions of the design. Not all photos include it. It is an optional piece that I like. The extra piece of land gets adhered directly to the background paper. Measure down 2 7/8" from the top. The straight bottom of the black piece lines up at that point. I used glue dots to adhere it. Adhere the background to the inside of frame 4. I used a tape runner but other adhesives will work. Apply a small foam dot ( I cut a 1/4" square one in half) to the back of the heron body. Place it so it won't be visible when complete. Add a touch of tacky glue to the ripples near the heron's feet. Carefully position the heron on the background. The body will be in front of the background because of the dimensional dot. The ripples should be glued to the background. 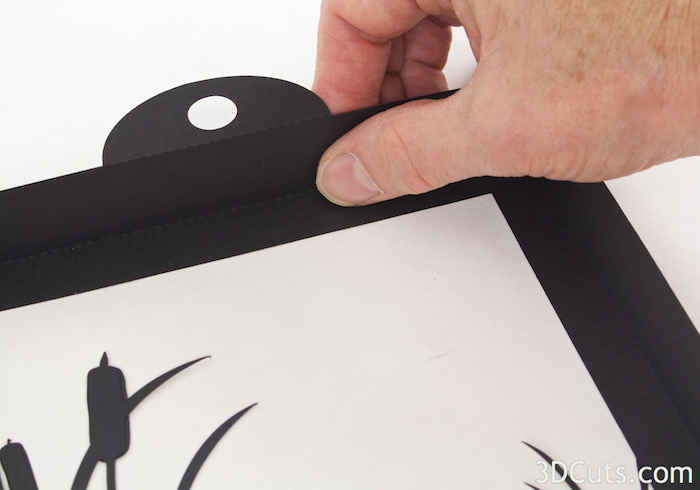 Add embellishments to the front of the shadow box. There are 3 different ones, 2 bunches of reeds and 1 branch. The placement of these is not critical and your choice but I put the large reeds in the lower left, the smaller reeds in the lower right and the branch in the upper right. Apply Scor-Tape to the front of the tab at the base of the reeds and attach it to the inside of the front frame being sure to hide the tab. Add a touch of glue to the reeds as the pass over the frame edge to help support them. Repeat with the reeds on the right side. 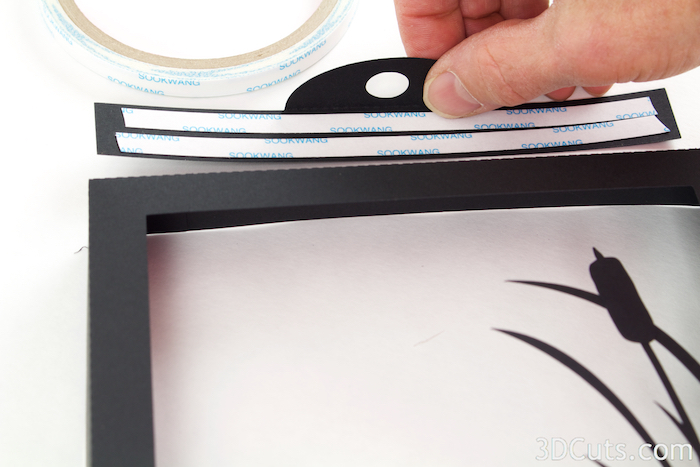 Add a bit of Scor-Tape to the end of the branch and adhere that to the inside of the frame. 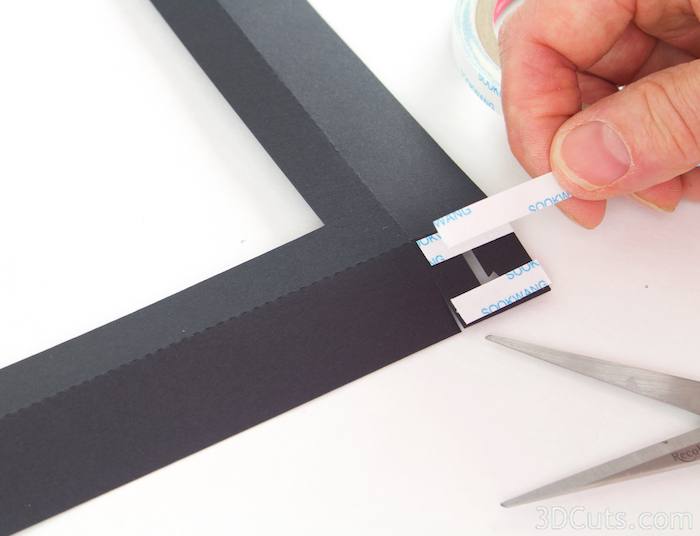 Add a touch of glue under the leaves to attach them to the frame. 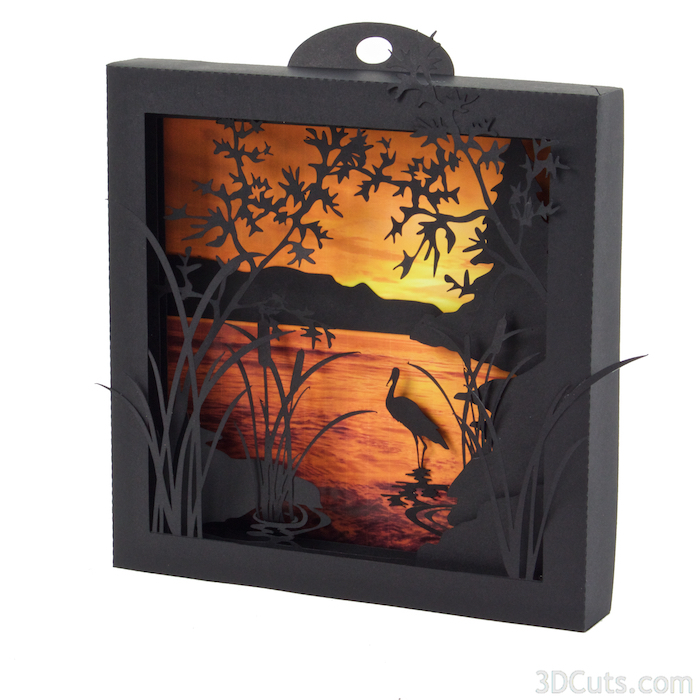 Here is the Heron Cove Shadow Box made with three of the backgrounds provided with the file download.